Hello and Welcome to HOMEWARD Found! Many of you are arriving here on my [brand spanking NEW] blog today via links from facebook. that she's sending her own loyal readers over here to check out my new blog! I have so much MORE to share with you for EVERY season! a 'Sweet Sweater Pumpkin', to one of YOU! FOLLOW this blog and then leave a comment on this post to enter. At the end of this week, I'll announce a winner! I'm going to be selling my pumpkins right here on the blog VERY SOON! I don't need to tell any of her readers how incredibly inspiring 'Miss Anne' IS. I only 'met' Anne a few months ago while working on a story about her for FOLK Magazine. and are really looking forward to the day when we will actually meet in person. Writing a feature about Anne, her life, her photography, her blog, and her creativity was a breeze. the way she generously shared her own and history with me... this woman is pure heart. and most importantly, it is an honor to call her my friend. I've truly enjoyed writing for FOLK Magazine for the past year. and I hope for the opportunity to continue to submit freelance work. and who work hard to be a blessing to everyone they come across. Anne certainly is. connected to this feature and also her own article published in this issue of FOLK. Make sure you visit her blog so that you can enter to win her great prizes. ...and tell her that Deb sent you! Hi Deb! First, I received my first Folk Magazine in the mail last week and am still reading it. Just love it and the article on Ann Lory is fab! and shared your new facebook page! wow! Good for you! Everything looks so beautiful...can't wait to see what's up ahead for you and the new adventure...love the sweater pumpkins and would love to see one on my buffet this year! Loved waking up this morning and finding another beautiful blog to visit. So glad to see you are exploring new creative outlets! I've come over from Anne's blog. Anything Anne recommends has got to be good, so here I am and here I stay, lol. I can see this is going to be a great blog. Hello Deb!! 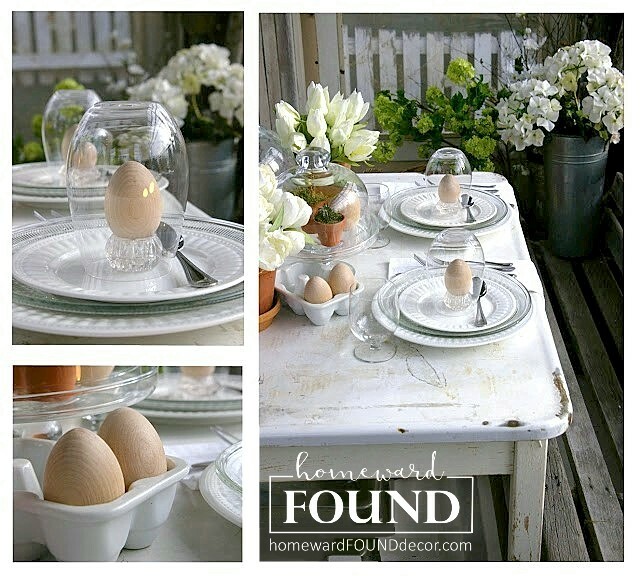 I'm very excited about your Homeward Found blog! I'm looking forward to Halloween and the Fall season of decorating. Your ideas are most likely going to be all over my house this year. I'm happy to support your pages and I'll also have a great time looking into your new friend Anne's blog as well. Congrats on your new journey. I can tell it's going to be great!! I an a new follower ~ have a great day! What a lovely blog you have! Your sweater pumpkins are gorgeous and I would love the chance to win one! (If not, I look forward to your tutorial though!) I loved reading about your outlook on decorating and look forward to future posts. Found you through Ann Lorys - can't wait to read all your posts! Again... CONGRATULATIONS! This is such a wonderful idea and I am so excited for you. Can't wait to hear more about this! Hi Deb, I came over from Anne's. Your new blog is wonderful, I'm putting you on my sidebar right now to keep up with all your great projects. Here in the Midwest we're all ready for Fall!! Your piece was wonderful on Anne. I'm a subscriber to Folk and really enjoyed your feature on her. Anne and I are great friends and she and her husband visited here for a week this summer. Just joined you as a follower, glad to see you starting a new blog! Hi! I came on over from "Twig and Fiona" blog and am following you now on GFC. I would love to be entered for the pumpkin too. I am still trying to finish up Summer projects that I had in mind back in May but I know blogland will soon be filled with Fall decorating projects....gotta hurry! Sent over by Anne and so happy I was...lovely ideas. Just came in from the garden, so hot and humid! Fall sounds great! The pumpkins are adorable! Hi Deb.....I am so incredibly happy for you....you found your bliss again!!! Skipped over to your new blog from FB posting :-) Can't wait to see what you create for us. Love the pic of the sweater pumpkin adorned with vintage jewelry! WOW! You have an amazing blog. I am so glad Anne sent us over to meet you. I became a follower right away. I am the same as Diana, I would like to receive all your posts via my email. Thanks so very much. BTW - Please enter me for your generous giveaway. What a Lovely Blog... so glad Anne sent us over! May you have continued Success. Love fiona and twig. Been a follower for a long time. Now I'm also following you. I can't wait to see the article. 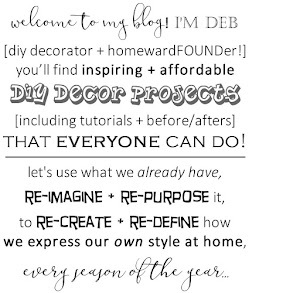 Hi Deb, Your blog is just as amazing as you are. You are such a great inspiration to me...I really needed this right now...thank you! I also just love Anne...on my way over right now. Hi Deb! Hopped over from Anne's...looking forward to being a follower of your blog! Hi Deb! So excited to see your new blog from one Washingtontonian to another. I am in love, love, love with the sweater pumpkins. I'll be looking forward to all of your posts - already addicted! I found you via Fiona & Twig. Thanks for the fabulous giveaway! Hi Deb~Just love your blog and the sweater pumpkins are so cute!I can't wait to see what you come up with next!Thanx for the chance to win a darling sweater pumpkin! Hi Deb! Yay!! I'm so happy to see your new blog!! 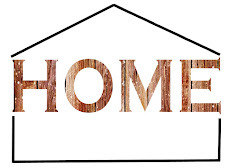 You always have such wonderful ideas to make our home beautiful! Thank you for the chance to win one of your darlin' Sweet Sweater Pumpkins! Best of luck to you on your new blog and thanks for the opportunity to win one of your sweater pumpkins! I'm visiting from Fiona & Twig. I love all of your pumpkin ideas! Fall is my favorite season and I am so looking forward to it after this very hot summer in the Midwest. I'm now following your blog. its great to meet you! What a great blog, such beautiful photos! Fiona and Twig lead me here , I'm so glad she did! Just found and followed you thru Fiona&Twig. I'm very intrigued to see the newest issue of Folk. Love getting new ideas for decorating and making interesting decorations for our home. I was looking at some of your creations and was intrigued. I enjoy finding new blogs to visit and learn from. Congratulations on your feature.Found you through Anne at Fiona and Twig.Now following along! So nice to come across you blog via Anne, the magazine looks to be very interesting, I would love to be entered into you drawing for a pumpkin how creative!! And I would love to find out more about the magazine! Come by and visit me sometime! I am already a follower (Thanks to Anne) LOVE all your pumpkins! I appreciate the chance to win one! Ps. do you have a blog badge? Congratulations Deb!! Your blog is beautiful and inspiring...just became a follower!! I'm loving those globe pumpkins...and hoping to win one of your sweater pumpkins! I am so very thankful that our paths crossed, and I will forever be grateful to you for that beautiful feature you did on me. Most especially because of the way you incorporated all the people and things that mean the most to me. I look forward to many years of friendship, Deb! I'm your newest follower! Your blog is already beautiful and inspiring! I can't wait to see what you come up with next! So happy to be following along and am looking forward to catching up with you! I'm your newest follower and I saw your last post with the pumpkin lights. This was my first time seeing them and I was so excited, because I have some of those globes up in the attic. I love your blog. I am a new follower. So glad to have found your blog! How utterly exciting for you Deb! What a wonderful blog...feels like we could be chatting over tea. Brilliant idea, making pumpkins out of those old globes, and enjoyed your tips to bring Fall home. 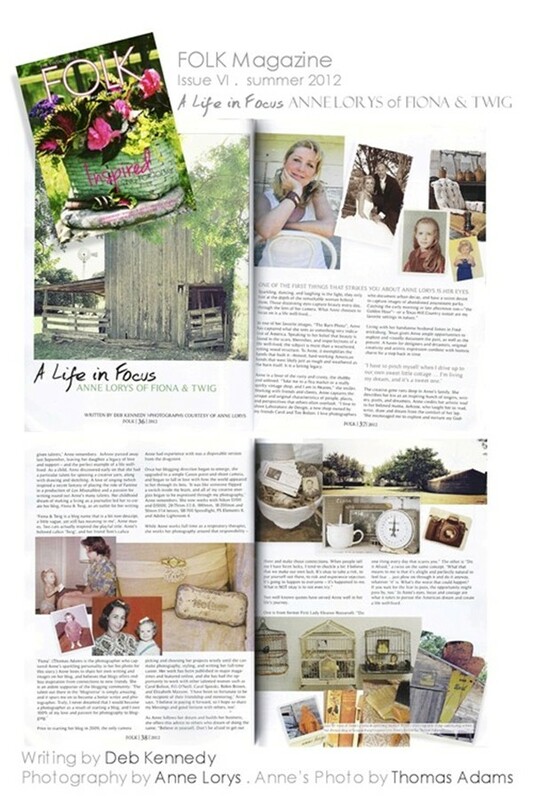 And excited to be selling Folk Magazine at my shop in the fall...it's a small world & I LOVE it! Best of luck & Big Hugs to you! at Anne's blog (who I adore but have never met!! ..funny how blogs are!) But anywhos, I will be back for more visits! The article you wrote on Miss Anne must be just as awesome as she is. coming over to say Hi, from Aunt Ruthies~! I LOVE your blog!! You have amazing talent and the sweater pumpkins are darling:) Thanks so much!! Debi, what an incredibly beautiful site! I love it! The moment I clicked on I fell in love and felt right at home. Taking my lap top to my favorite over stuffed chair, snuggling in and going to enjoy your beautiful handiwork! Thank you for sharing your talents and the opportunity to win one of those cute sweater pumpkins! I'm a new follower! Oooooo...so love this blog! Going to take a break while my baby boy is sleeping to look and dream! Aunt Ruthie sent me! So love this! Thanks! I am now a follower (thanks Fiona and Twig for heading me here) I have alot of looking to do tonite on your blog! your sweater pumpkins are adorable.....new follower here, also. So happy to find your blog today! Your sweater pumpkins are beautiful! Can't wait to see more on your new blog! Congrats on your success! Thanks for making us aware of the blog. Please enter my name in the contest! Haha, was typing fast, lol! Love the little "pumpkins" & I don't know what a sweather is but a "sweater" yes, that's what I like:) lol! My dear friend, Deb!!! You're back!!! Yeah!!!!!!!!! You have been missed, by more than just me! So glad to see you here. Can't wait to read all about you again and see what's new. Are you enjoying your new place? The PNW misses you and your wonderful events...me especially!!! I sooooo hope I win one of your gorgeous pumpkins...fall is my favorite time, and I was so disappointed that I couldn't take your class. Liking you on fb and following your blog now, so I can't wait to see more! Love you dearly, sweet girl! I love this blag and can not wait to see what is to come! Miss Holly, thank you so much! I miss you, too! Love the sweater pumpkins and I love Aunt Ruthie...so I know if she recommends your blog...then it must be wonderful! Those are sweet pumpkins. Love the color and bling. I am new to your blog from Fiona & Twig. I am signing up to follow you. I'd love it if you had a sec to visit me. Hope you have a lovely day. I am visiting from Fiona and Twig. I love your blog! So glad to find your new blog! Will miss seeing all your lovely creations at Farm Chicks! What a fun and surely less exhausting way to share your creative brilliance with us. 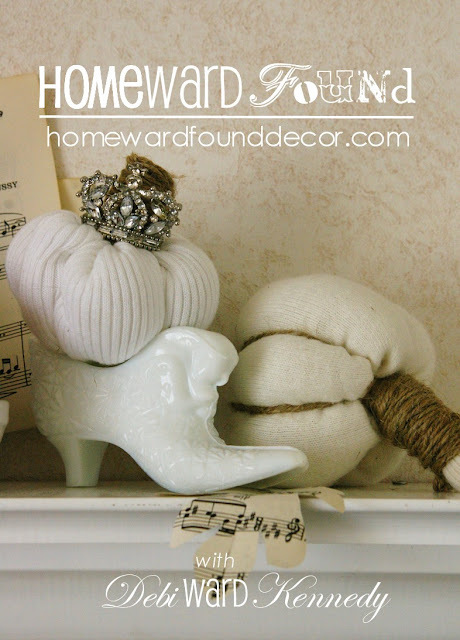 So happy to find your new blog, and loving these fall decorating ideas. Thank you for sharing! I just found your blog over at Cozy Little House where Brenda featured you. I love the sweater pumpkins and would love to win one. I also love the ones made from the old light globes. You have so many creative ideas I had to follow you! hi! found your blog via folk magazine and now following by email! love all your clever ideas. those sweater pumpkins are sooo darn cute! I found you through a Pin by Funky Junk Interiors. Your site is great and no one would guess it's so new! I would love a sweater pumpkin and good luck in your new venture! Hi Deb, I won a copy of this great magazine from Anne. So excited!!! Thank you...can't wait to get it. Been so busy...may be making another big move in my life (for the better)...share soon.